Inflatable pontoon fishing boats are an amazing way to spend your time on the water. 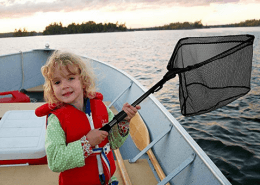 Whether you choose to use a trolling motor to get around or you use oars to maneuver around on the water, fishing from a 1 person pontoon boat is an amazing way to get to those secret fishing holes. If you’re looking for luxury you can get yourself one of the ‘luxury’ editions of inflatable pontoon boats but if you simply looking to hit the water and then figure things out, you can get a hold of a more basic model that will get the job done just as good. These pontoon boats are exceptional for the weekend angler who wants to hit the water for a day fishing trip without the hassle of launching a full sized boat. Simply show up the your favorite fishing location, pump up your inflatable fishing boat and hit the water. When it’s time to go home, simply deflate the pontoons and you’re on your way. If you’re on the market for an inflatable pontoon boat your might be asking yourself, “What are the best inflatable pontoon boats? What is the best one man pontoon boat? 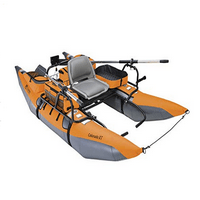 or What are the best fly fishing pontoon boats?” If you’re thinking this or just looking for the best inflatable pontoon boat reviews you’ve come to the right place. 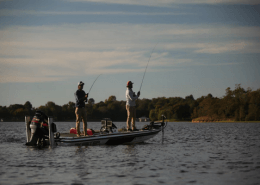 Here are our picks for the top 4 inflatable pontoon fishing boats for the money in 2019. This high capacity 9 foot inflatable pontoon boat was designed specifically around the angler and their ability to stay out on the water for long, unbroken duration’s of time. This boat comes with a 2 year limited warranty allowing you to put it through its paces, but this pontoon boat is built around durability and longevity. The underside is protected by heavy duty abrasion resistant PVC meaning you can rest assured this pontoon boat will fair well in some of the most hostile of environments. The top is constructed out of a rugged nylon material making it durable while also giving it a quality feel and texture. 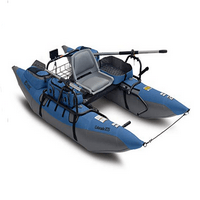 There are countless storage options on this inflatable pontoon boat which include 10 mesh pockets, 12 zipper pocket, 2 fully insulated drink holders, fishing rod holders and an oversized rear storage rack which has an incorporated motor mount. Talk about storage availability. You can easily pack enough fishing gear on this pontoon boat to last you an entire day out on the water. You’ll also be pleased to find that detachable fly patches have been incorporated onto the side storage area so you can have your fly gear at the ready at all times. This inflatable pontoon boat comes in at only 71.5 pounds meaning it can easily be moved from location to location with little effort. 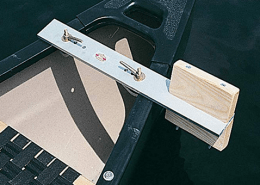 This boat also comes equipped with (2) 7 foot 2-piece aluminum oars making it easy for the angler to move from location to location without the need for a motor if one isn’t present, or in case of an emergency situation. 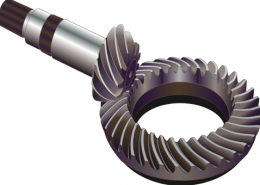 A mesh anchor system has been incorporated with a pulley system to help keep you in a stationary spot if need be which can easily be filled, and emptied as need be. If you’re looking for a reliable and well built inflatable pontoon boat, this one is an ideal candidate. 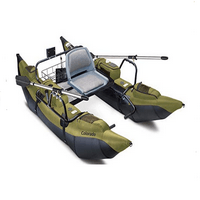 The Colorado XT inflatable pontoon boat comes in at 9 feet in length, 56 inches wide and weighs in at only 77 pounds making it relatively easy to transport for most anglers from location to location. It can hold a maximum capacity of 400 pounds which encompasses the weight of the angler and the weight of their fishing equipment. 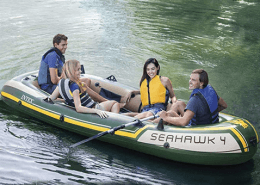 There are (2) 7 foot 2-piece aluminum oars included with this inflatable pontoon boat meaning you can easily use this boat without having a motor. 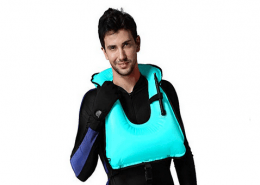 This boat is constructed out of heavy duty nylon which is durable, strong and good looking. The lower sections of the pontoons is protected by an abrasive resistant PVC material making strong and reliable in even the most dangerous of environments and situations. This inflatable pontoon has massive amounts of storage space which includes 20 pockets, 2 completely insulated drink holders and a rear storage platform. The side storage has detachable micro slit foam patch, on both the right and left side, allowing you to have your fishing gear ready to go at all times, regardless of whether you’re right or left handed. A transportation wheel is included which allows you to move this inflatable pontoon boat much like you would a wheelbarrow. This is ideal largely due to the fact that this makes it easy and convenient for angler of all ages and strengthens the ability to move is boat from place to place. 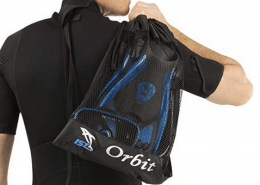 Another great feature is the fact that the removable side storage bags can be taken off and turned into a portable gear bag making it easy to transport additional gear from place to place. If you’re looking for an inflatable pontoon boat that is filled to the brim with features, then you don’t need to look any further. This pontoon boat is the one for you. Classic Accessories has really outdone themselves with this inflatable pontoon boat. Like many of their other pontoon boats it comes in at 9 feet in length and has a 400 pound weight capacity which takes into consideration the angler and their equipment. With the XTS you’ll get a massive amount of storage space which includes a rear mounted rack that includes a motor mount, to side storage areas which can be easily removed and turned into a portable gear bag, 2 insulated cup holders and over 20 storage pockets. Talk about all the storage capacity and accessories you’ll ever need! 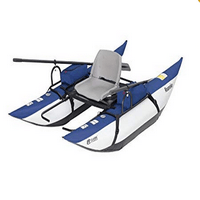 As if that weren’t enough, this inflatable pontoon boat comes with a swivel seat. This means you, the angler, will have 360 degrees of free range to spin around to any part of the boat regardless of the main direction of the boat itself. This is a game changer if you’re accustomed to only having the ability to fish in the direction of where your boat is pointing. Incorporated with this pontoon boat are 2 aluminum oars which are ideal for those anglers who take pleasure in moving themselves from place to place. This boat comes in a 80 pound, which might seem heavy, but this is why they added in a transportation wheel. This wheel makes it easy for anyone to move this pontoon boat from one fishing spot to another with ease. 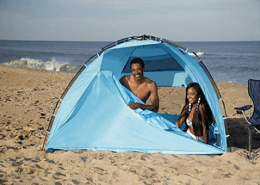 The haul is made from a heavy duty nylon material making it durable and dependable. The bottom of these pontoons have been covered in a strong abrasive material which helps protect your pontoons from sharp and abrasive objects. If you’re anything like us, you can see yourself spending long, relaxing days out on the water in one of these. If you’re looking for a reliable, durable and cost effective inflatable pontoon boat then the Roanoke is the perfect boat for you. 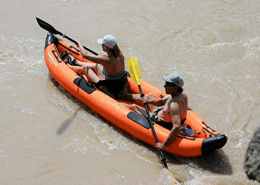 Like all of Classic Accessories inflatable pontoon boats the pontoons are made of a heavy duty nylon that is strong and dependable. The bottoms of these pontoons are covered in a very tough abrasion resistant PVC meaning they can take their fair share of abuse. Two large zippered pockets have been incorporated onto the tops of the pontoons which double as armrests. These pockets are large and can easily store a massive amount of fishing gear such as fishing sunglasses, fishing tackle backpacks, reels and any additional fishing equipment needed. To the rear of the seat you will find a storage platform that is ideal storing any overflow items you might have such as tackle boxes or additional fishing equipment. In front of the seat you will find two completely adjustable foot rests which can be adjusted to a wide range of lengths to help make this pontoon boat comfortable to anglers of all sizes. This boat comes with (2) 6 foot aluminum oars which makes it easy for the angler to move from fishing hole to fishing hole with ease making it a great river pontoon boat. If you’re looking for an entry level inflatable pontoon boat that won’t break the bank, this is the pontoon boat for you.